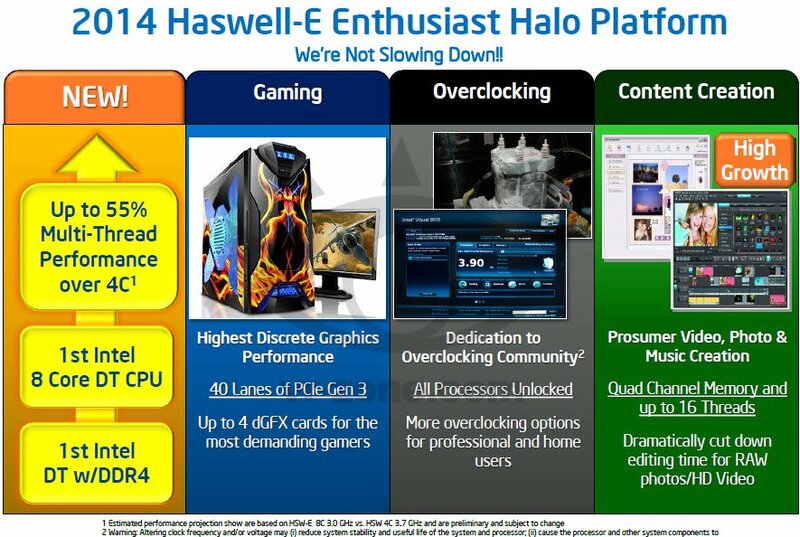 Intel’s Haswell-E platform will launch in 2014 packing 8 core CPUs. The platform will provide users with up to 20 MB of L3 cache and with Hyper Threading, the final result is a maximum of 16 logical cores. The processors will be based on 22 nm second generation Hi-k process. Compared to the Ivy Bridge-E, the new platform is expected to deliver 33 to 50% better performance. The company will also introduce the Wellsburg motherboard chipset with support for DDR4 RAM clocked at up to 2133 MHz. Connectivity options supported by Wellsburg X-PCH include a maximum of 6 USB 3.0 ports, up to 8 USB 2.0 ports, up to 10 SATA 6 Gbps ports, integrated clock support and 6.5W TDP. Clockspeeds for DDR4 type RAM installed on Wellsburg are in steps of 1333 MHz, 1600 MHz, 1866 MHz and 2133 MHz. The increased frequncies combined with quad-channel DDR4 RAM are expected to yield nearly 50% increase in bandwidth compared to triple-channel configuration. Wellsburg supports low voltage DDR4 RAM kits at 1.2V with a 288 pin DIMM connector, 4 pins are added for NVDIMM module support. Both 284/288 pin RAM modules can be used on the motherboard with the 284 or the 288 pin connector.